M. came to Montreal from the Carribbean 35 years ago, looking for a better life for herself, and to support her kids who she had to leave behind. After working and building community in Montreal for more than half her life, she is facing health and financial difficulties related to getting older. 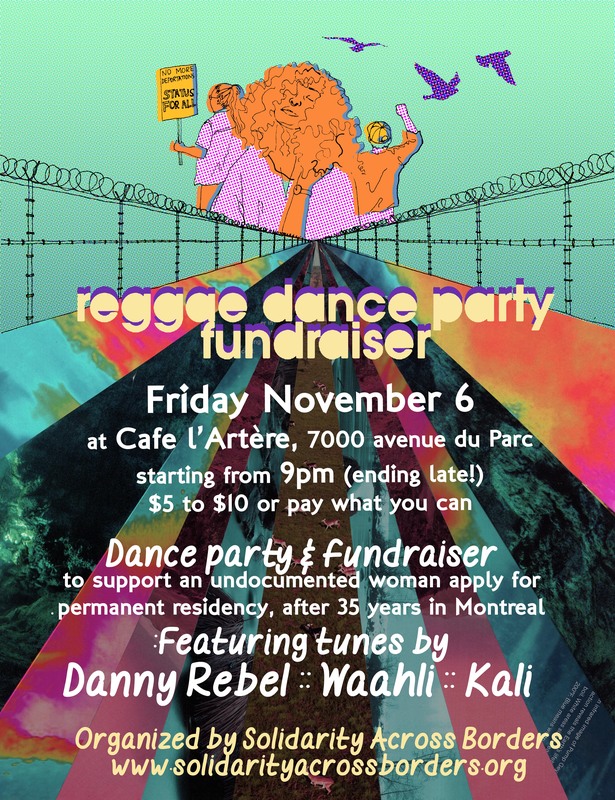 M. is one of over 50,000 undocumented residents of Montreal. Living without status means that she has NO access to medical insurance, or any kind of state financial assistance, basic supports that residents with permanent status and citizenship take for granted. .
Members of Solidarity Across Borders are supporting M. in putting in a Humanitarian and Compassionate application, in the hopes of regularizing her status and finally being able to access some of the basic securities (health care, housing, and financial assistance) that should be afforded to everyone regardless of immigration status. As we mobilize to support a member of our community in a time of financial need, we ground our efforts in collective struggles against deportations, and against the racist canadian immigration regime that excludes thousands of individuals and families from basic security and autonomy every day. NO MORE DEPORTATIONS! STATUS FOR ALL!